Handheld meat pies are a comforting Irish dish. 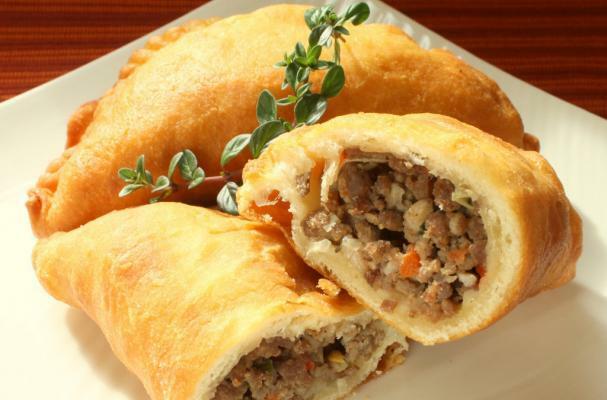 If you are throwing a St. Patrick's day party, these meat pies are a must-have on the menu. Ground beef and pork are flavored with garlic, green onion, and red bell pepper. The filling is tucked into a homemade dough and deep fried. If you are short on time, you can make this recipe with pre-made pie dough and bake the pies instead of fry them. Pour vegetable oil in a large frying pan set over medium high heat; brown meat in oil. Add the onion and bell pepper; cook, stirring frequently until vegetables are soft, approximately 5 minutes; add garlic and sauté for 1 minute longer. Add red pepper flakes and salt and pepper to taste. Set aside until ready to use. Sift flour, salt and baking powder together into a large bowl or in the bowl of a food processor (this makes quick work of this step); process or cut in shortening by hand until it looks like cornmeal. Stir the eggs and milk together before slowly stirring into the flour mixture; mix well to form a soft dough. Divide the dough into 16 equal portions. Dust a clean dry surface with flour. Roll each dough portion into a ball. Place each ball on the floured surface one at a time before rolling it into circle about 6 – 8” in diameter. Spoon approximately 2 heaping tablespoons of the meat mixture onto one side of the circle, leaving a 1” clean edge all around. Brush edges with a little warm water. Fold the circle over the meat mixture matching the edges, forming a semi-circle. Fold the edges in half up towards the meat leaving a 1/2" edge. Press the edge with the tines of a fork to crimp. Repeat with the remaining meat and dough. Heat deep fryer oil or pour enough oil into a medium size frying pan to come up to a 1” depth in the pan; heat over medium high heat. When the oil is hot and shimmering place 1 – 2 pies in the pan and fry to a golden brown on each, approximately 3 minutes or so. Remove from the heat and drain on paper towels. Serve hot or at room temperature.